Is there a dream you carry inside? That is the question asked by Bonnie of Faith Barista today. 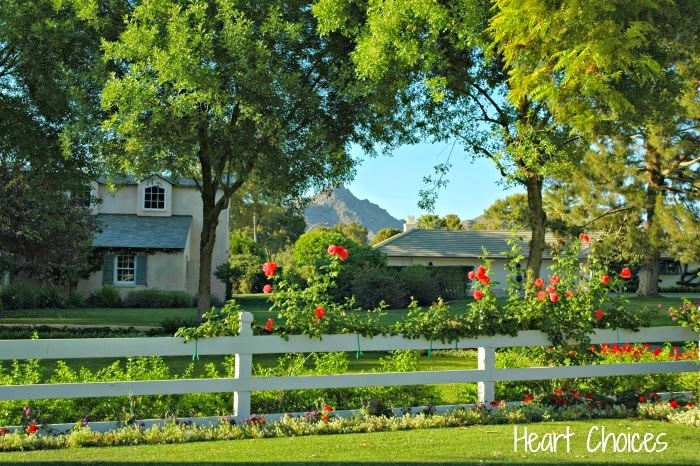 I look at the photo above with the white picket fence, blooming flowers and serene background. It's lovely. As a teenager, this was my dream. I wanted to get married, have children and live in a house with a white picket fence. And of course ...to live happily ever after. But I've learned many lessons through the years. The place where I live may change. My bank account balance may change. But what's more important is my character. Who am I when I get knocked down? Who am I when life doesn't go as I planned? 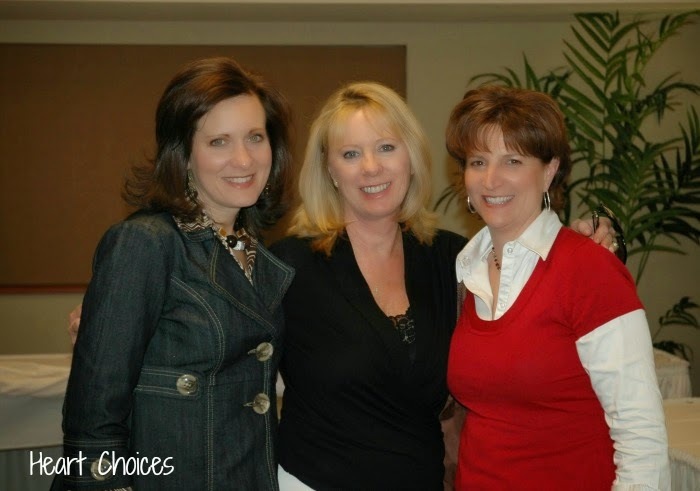 In 2007, Lysa TerKeurst was the keynote speaker at my church's annual women's conference. I had the pleasure of picking her up at the airport and driving her around for the weekend. We had the opportunity to talk privately about life challenges. Lysa wrote something down for me and I always keep it close by. I didn't realize at the time how prophetic it would be for me. I thought God's dream for me was to become a public speaker. I trained for it. I attended seminars to learn and grow. I started writing a book. I spoke at a few events. But now it is eight years later. I'm not in the place I dreamed of being at this point in my life. I'm working full time in a profession so different from my previous nursing career. I'm not living in the house with the white picket fence. But then I realize that God did plant a dream in my heart. It is slowly being realized in ways I never anticipated. I want to inspire others. It doesn't matter where I live or what my job is. Right now I teach a class of preschoolers. I get to speak to them every day. And they are a captive audience. I may have to use a variety of techniques to keep their attention. But the kid in me comes out when I'm with the children. I hope to inspire them as I teach them about bucket filling. After winning a giveaway on Meaningful Mama's blog, I've been teaching them about being kind, sharing with others and how to fill their mom and dad's imaginary bucket. I've gone through some major life changes. But one thing has never changed. I know God loves me and is with me through it all. I've learned to trust Him in the good times and in the not so good times. He has a plan and a purpose for my life. And I want to live out that purpose in the every day fields of life. Yes, there is a dream I carry inside me. But I need to take time to listen to God's leading and not get so busy, busy, busy. "We so often assume we know the Holy Spirit without listening and plow forward in our serving without taking the time to tune in to His guidance." So I make the choice to pray, read my Bible and listen to the Spirit's prompting. I'm linking up with Bonnie of Faith Barista for Beloved Brews Thursdays. Beautiful post, Debbie! This is just what I needed today. 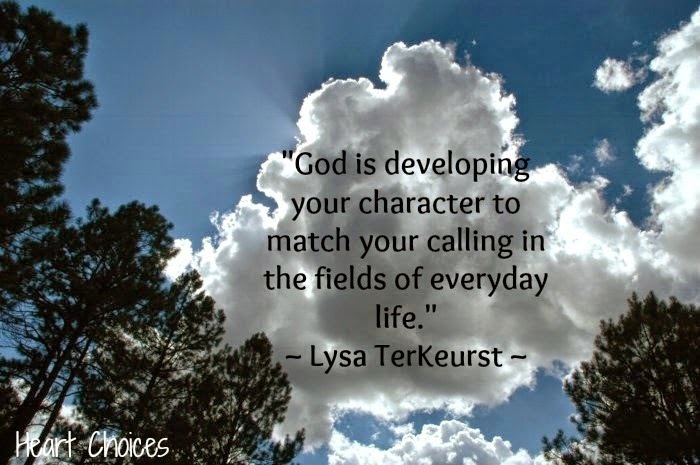 Blessed by your post, and happy to be your neighbor today the Faith Barista's link up. I especially enjoyed your bulleted list of blessing. Well I can't say enough about this post...it blessed my socks off. I laugh because I had just emailed you back and even said, I am going to go read your post, you alway inspire me! and then that is in your post. Life, so different and yet, God knew all along what He was doing. Great post. I know you've been a nurse like me. I wanted to be an architect and anything related with drawing/arts but ended up to be a nurse. Now, many days, I often ponder of doing something else. I believe the Lord sends whoever He thinks will learn something as He scatters those who will obey in different areas of this world. But it's easy to get frustrated many times and often, it's hard to see what lies ahead but that's where trusting the Lord should come in because He does knows best. What doesn't make sense at the beginning often helps us realize much later that "Yeah! I get it..."
So, I'll say never tire doing what you love because you never know how many are encouraged and are inspired by the strength and love you reflect from His light. Even now as I'm typing, my heart hungers to do something else. But no matter what we end up doing (I'll call it His assignment), I pray for the Lord to always grant us His strength and guidance. What's awesome, whether we succeed or fail, I know there are many praying sisters like you who remind me that I'm not alone in this journey. Love and blessings to you sister and keep shining...For Him. BTW, I thought of you when I was watching "Fixer Upper" last night.LOL. This was a GREAT post Debbie, full of such wisdom and truth. Even though my dream was to get married and raise a family and it did come true, MANY other things and sections of my life were nothing as I saw them. I wanted to teach too and that never did happen. I was an aide for a while, but really not the same. God has used you in a mighty way in many lives, and at the end of the day that should be all of our dreams. To be used by God as He sees fit,. I wonder how much you have influenced the lives of those little ones you teach...WAY more then you will probably ever know. And their parents too. Enjoy your week-end! And inspire, you do! I am always encouraged by what you share and enjoy every visit! HI Debbie, I loved this post-so perfect for all of us. You and I have shared a similar dream of our hearts for many years now, I can't wait to see how the Lord answers it. Your list reflects a high calling, Debbie. I can see you achieving every bit of it as you are a woman who loves her God. The books sounds intriguing. Hope you write it. There would be no other like it since it would be your experiences first hand! Then you can market it and speak about it everywhere!!!! Oh, Debbie, I think of you so often and path that your life has taken and how you have adjusted so beautifully and allowed the Lord to use you. You are so inspiring and I'm sorry that so many miles separate us. I'd love to meet you and spend an afternoon sipping coffee and talking. Loved your list and your testimony! Blessings abundant! I know finding your blog this afternoon was a God thing. Thank you for a beautiful post. You have inspired me-just as you described in your writing. 'the dreams I carry inside'.